Some great reviews for the newly released Percy Phillips Studio Collection on CD and vinyl are appearing online and in print. Ken Kessler of Hi Fi News writes, 'For the Quarrymen tracks alone, Beatles fans need this: for those interested in the history of Merseybeat in general, this is the Rosetta Stone.' Read Ken's review here. And Paul Rigby at Audiophile Man has published an in depth article about Percy and an interview with Peter Phillips along with lots of photographs online here. The newly launched Liverpool Echo Beatles City Podcast has recorded an hour long interview with Peter Phillips in which Laura Davis talks to Peter about his Grandfather's life and the studio. You can hear Peter's podcast here. Beatles City Podcast has recorded 10 interviews for their Beatles series including Pete Best, Freda Kelly, Rod Davis and an exclusive 30 minute phone interview with Paul McCartney, in which he talks about his several visits to Liverpool during the year and how he felt about visiting his childhood home during his 'Carpool Karaoke' episode and playing a gig at the Cavern Club. You can listen to Paul's podcast here. The December 8th 2018 London launch of The Percy Phillips Studio Collection was a great success as Peter Phillips presented the story of Liverpool’s 1st recording studio to Beatles fans at the London Beatles Day, presented by beatlesdays.com. Visitors to the event could browse through and buy a selection of rare vinyl by the Beatles and other artists and buy a wide selection of memorabilia and many people took the opportunity to find out more about the Percy Phillips studio and buy the 4 CD box set of recordings made at the studio, along with the popular 38 page booklet telling the story of Percy’s life. Rare vinyl at London Beatles Day. Peter Phillips at the London event. Peter Phillips also told us that the long wait for delivery of the limited edition 10” vinyl double album is now over. The vinyl has been delivered to Speakeasy Recordings from the manufacturer and is now being sent out to the large number of people who pre ordered and is available to buy at www.percyphillips.com. Demand for the album has been high and Peter Phillips and Speakeasy Recordings would like to apologise for the delay in delivery of the vinyl, which is a limited run of 500 copies only. Any future production of the vinyl will be a double 12” LP. After the incredible launch of the Percy Phillips Collection exhibition in Liverpool at the Beatles Convention the show moves to London on Saturday 8th December at Christ the Saviour Parish Church New Broadway, Ealing, London W5 2XA. Peter Phillips will be on hand to tell you all about his Granpa (as Macca calls Percy) helped by Tom and Charlie Bigham in charge of the merchandise. There’ll be CDs, limited edition vinyl, posters, T shirts, stickers and much much more – ideal Christmas gifts for Beatle fans young and old. Percy Phillips – Liverpool’s first recording studio, recorded The Quarrymen, Beatles, Ken Dodd, Billy Fury and hundreds more from 1955 to 1969. The Phillips family have entrusted the Collection to Speakeasy Recordings for global distribution and exhibition. A truly unique historical set of recordings. Percy Phillips at the 2018 Beatles Convention. The Adelphi Hotel Empire Room was the location for the World premiere of The Percy Phillips Studio Collection Exhibition. The World premiere of The Percy Phillips Studio Collection and Exhibition took place on the 26th August at the Beatles Convention in Liverpool and phillipsacetates.com were there with the hundreds of other visitors to enjoy the spectacle. ​The day began with a talk by Peter Phillips, who told the Convention the story of his Grandfather’s recording studio, the first in Liverpool. Following that, Peter introduced Julia Baird and Carol Higgins, who together pulled a cord which opened the curtains to reveal the stunning new commemorative plaque for Percy Phillips and his studio. There was a real sense of excitement in the Empire Room as the cameras flashed and a large crowd of onlookers surged forward to catch a glimpse of the plaque. Shortly afterwards, in a very happy atmosphere, Pete Goodall of Speakeasy recordings presented a CD box set of the Studio Collection to an Everton FC representative and then Pete introduced Peter Phillips, who gave a short account of Ken Dodd’s visits to the studio in the late 1950s and then presented a specially commissioned gold disc of Sir Ken’s first record to Lady Anne Dodd, who graciously accepted this wonderful tribute to her much loved late husband. Again the cameras were flashing and the room was packed to bursting with Beatles fans from around the World, Phillips family members, Merseybeat musicians including Owen Clayton and Mike Byrne (who both made discs at Percy’s studio), journalists, bloggers and many others who had come to find out about Percy Phillips and see the new exhibition. Also in the room was Quarry Men pianist John ‘Duff’ Lowe, who was kept busy signing his superb images of the 1958 Quarry Men disc throughout the day. Peter Phillips addresses the Beatles Convention. Pete Goodall presents a Percy Phillips Studio Collection box set to an Everton FC representative. The new commemorative plaque is unveiled by Carol Higgins (Percy Phillips' daughter) and Julia Baird (John Lennon's sister). Lady Anne Dodd receives a gold disc of her late husband Sir Ken's first disc. Carol and Julia. Beautiful smiles on a fabulous day. Peter Phillips and Quarry Man John 'Duff' Lowe. Congratulations to Peter Phillips and Pete Goodall for creating this amazing event. ​The beautifully arranged exhibition, which filled the Empire Room at the Adelphi Hotel, contained many previously unseen items and artefacts, including acetate discs made at Percy’s studio, the Vortexion tape recorder from the studio, the studio log book, Percy’s birth certificate and other family papers including two unique letters that George Harrison had written to Percy’s daughter Carol in 1962 from the Star Cub in Hamburg, a note to Peter Phillips from Paul McCartney, many previously unseen photographs, Peter Phillips’ replica of the 1958 Quarry Men acetate and a large amount of written and printed material telling the story of Percy Phillips’ life and the studio. There was also an excellent merchandise store in the room, where visitors could buy the CD box set, the 10” limited edition vinyl and a wide variety of souvenir merchandise, including T shirts, pens, baseball caps, mugs, posters, stickers, coasters and even miniature replicas of the new blue plaque. Part of the Percy Phillips exhibition. Photo by Chris Lee. Percy Phillips' Vortexion tape recorder. Amber and Brendan at work in the exhibition shop. Well done to all involved in the launch event, it has certainly been many years in the making and it was enormously exciting for us to be there on such a special day to see the previously unknown story of Percy Phillips and his studio told with such respect and in such great detail and to at last hear this collection of recordings that were made there. The event was a great addition to the Beatles Convention and International Beatle Week, which reviews are saying was one of the best ever. 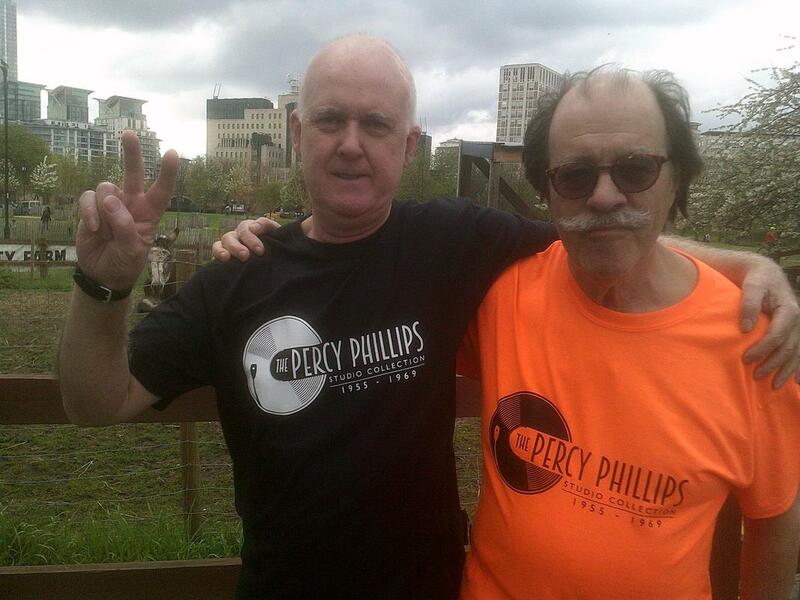 You can visit percyphillips.com to buy the CD, vinyl and merchandise and learn more about the studio. The Percy Phillips Facebook page has up to date information about future releases and where the fascinating exhibition will be appearing next. Album and Exhibition launch details. Here are more details about the launch of The Percy Phillips Studio Collection at the Beatles Convention on the 26th August. Here at phillipsacetates.com we're very excited that International Beatle Week will be starting in a few days in Liverpool and we're looking forward to attending many exciting events in the City, particularly the Beatles Convention on Sunday 26th August at the Adelphi Hotel. Peter Phillips will be giving a presentation to the Convention at 10.30am, followed by the official opening of the Percy Phillips Exhibition and launch of the 4 CD set and limited edition 10" vinyl double album, in the Empire Room. At 11.30 the new commemorative plaque will be unveiled by Julia Baird and Carol Higgins and then around 12 noon, Lady Anne Dodd will be presented with a specially made gold disc of her late husband Sir Ken's first record. 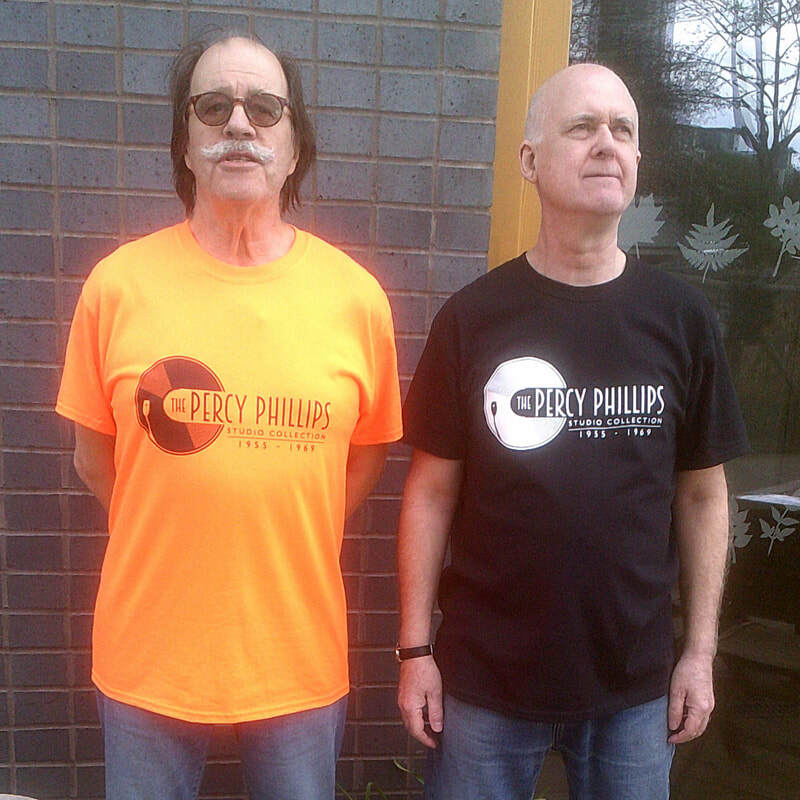 The CDs and album will be on sale in the Empire Room throughout the day as will some nice items of merchandise with the Percy Phillips Collection logo. ​This really is a remarkable event considering that up until now Percy Phillips and his pioneering studio have not had such a tribute paid. Well done to Peter Phillips and Speakeasy Recordings. New CD and album artwork. ​The Percy Phillips Studio Collection will be available to buy, the answer is now. to pre order online at the official Percy Phillips website shop. which make very interesting reading and reveal some real surprises. Also for sale at the shop are some really great limited edition souvenir gifts, including T shirts; caps and tote bags. Thanks to Speakeasy Recordings for sending us these pics of the new CDs and vinyl artwork. Looks fab. Every disc tells a story. Every disc in the Percy Phillips archive has a story to tell. One disc in particular marks the beginning of one of the most incredible stories of all time. Their first ever record, 1958. Side 1. Side 2. First original song on disc. The story of the Beatles. 60 years ago, in July 1958, Liverpool teenagers John, Paul and George along with drummer Colin Hanton and piano player John Duff Lowe, made their first ever record, in Percy’s studio. A 10” 78 rpm acetate disc, on which Percy cut two tracks, ‘That’ll Be The Day’ and ‘In Spite Of All The Danger’, which is now in Paul McCartney’s record collection and is said to be the World’s most valuable record. Paul has been in a lot of studios and sung into a lot of microphones since but this where it started, 60 years ago. During the last couple weeks Peter Phillips has been doing some promotion for the release of The Percy Phillips Studio Collection. Peter appeared with Rhod Sharp on BBC Radio 5 Live and with Nick Robinson on the Today programme on BBC Radio 4 along with lots of local BBC stations, to talk about the release of the Percy Phillips archive of recordings at the Beatles Convention in August. The project is attracting a lot of interest as Percy Phillips and his role in Liverpool history is not really known very widely and so it is amazing to discover that there is this collection of recordings made during a period of massive change in our culture. And of course the fact that all these recordings were made by a man in his 60s in Liverpool’s first recordings studio. Peter also joined Pete Goodall for a meeting at the Cavern Club in Liverpool with Everton football Club. One of the discs on the CD has 2 tracks recorded in 1963 in Percy's studio by the title winning 1963 Everton team and Everton TV interviewed Peter Phillips about the session, which resulted in Britain’s first football pop song. 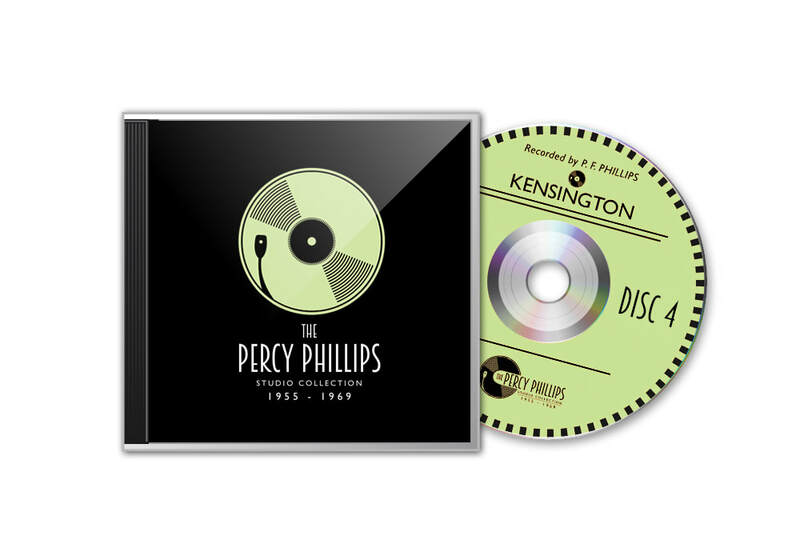 Speakeasy Recordings has announced that from this week, The Percy Phillips Studio Collection 4 CD set and limited edition 10” vinyl double album is available to pre order online at www.percyphillips.com along with a range of souvenir gifts. Peter Phillips talks to Darren on EFC TV from the Cavern Club, Liverpool. Pete Goodall, back at The Cavern. Peter Phillips and Pete Goodall at Liverpool's Cavern Club, July 2018. Phillipsacetates.com met up with Peter Phillips and Pete Goodall in London this week to talk about the forthcoming release of The Percy Phillips Studio Collection on CD and vinyl. 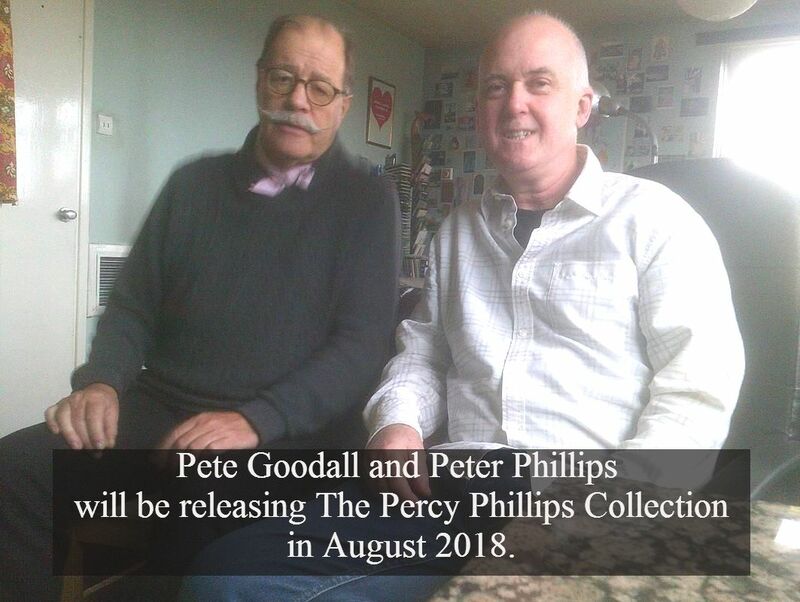 Pete Goodall and Peter Phillips are preparing to release The Percy Phillips Studio Collection on CD and limited edition vinyl at this year's Beatles Convention. Limited edition T-shirts will be available at this year's Beatles Convention in Liverpool on August 26th. It certainly will be a very special day at The Beatles Convention as this collection of previously unheard recordings from Liverpool's first recording studio are released together for the first time. You can visit the International Beatles Week website HERE to discover more about the many exciting things taking place during this year’s Beatle Week in Liverpool. There's some really cool new artwork and information about the launch of the CDs and vinyl. After the emotional scenes in Liverpool at the funeral and memorial service for Ken Dodd this week, here at phillipsacetates.com we were listening to the demo recordings that Doddy made at Percy Phillips’ Studio in 1957 and apart from Ken Dodd’s beautiful singing voice, we were struck by the excellent piano playing on the discs. Peter Phillips was telling us that his Grandma Hilda Phillips was the accompanist on the Ken Dodd recordings and indeed played piano on many of the discs made at Phillips Sound recording Service. The Ken Dodd demos, which have never been heard publicly before, will be released for the first time later this year as part of The Percy Phillips Studio Collection, at The Beatles Convention in Liverpool on 26th August in The Empire Room at the Adelphi Hotel. Hilda Phillips with the Studio equipment in 1992. During the 1930s, 40s, 50s, 60s and into the 1970s, number 38 Kensington was a hive of activity. Percy and Hilda Phillips raised their family there and they ran the battery charging service for 30 years, as many older Liverpudlians will remember. Then from the early 1950s their record shop in the ground floor front room was the place to go in Liverpool to find the best American imports of Country, Blues and R&B. From 1955 Percy operated his recording studio and disc cutting service and Hilda, who was an accomplished musician, played the piano on many of the recordings made there, including the Ken Dodd demos and during this whole time, Hilda Phillips rented out two rooms on the first floor as theatrical lodgings, mainly to actors from The Playhouse Theatre in the City. Hilda, who lived to the age of 97, was much loved by her family and many other Liverpudlians and is remembered for much more than her delicious home made jam sponge cake. It has been announced today that Liverpool comedy legend Ken Dodd has died. We received the following message from Peter Phillips. It is extremely sad and upsetting to hear that Liverpool legend and pioneer of comedy Ken Dodd died on Sunday, at home in Knotty Ash, Liverpool, at the age of 90. We offer our sincere sympathy to Doddy’s family. Ken Dodd in Percy Phillips' studio in 1957. The first disc Doddy cut. 'Tonight Beloved'. Percy's studio log book records this Ken Dodd session. We were looking forward to Ken Dodd being the guest of honour at the launch of 'The Percy Phillips Collection' at the Liverpool Beatles Convention in August, as he was a good friend of the Phillips family and spent many hours with Percy in the studio, where he made his first ever recordings in 1957. Ken Dodd lived his whole life in Knotty Ash (which is a real place on the outskirts of Liverpool) in the family home, which had been his father’s coal business. Ken started out as a singer but his skills as a comedian and ventriloquist, along with his unique appearance, led to his comedy persona becoming so popular that his singing took a back seat, although once he’d become a huge success as a comedian he released several records which hit the top of the charts in the UK, including ‘Tears’ and ‘Happiness’. During the 1960s and 70s Ken had top rated shows on radio and television with his loveable ventriloquist puppet characters that he created, called 'The Diddymen’ and with his comedy sketch shows. During this time Ken Dodd was one of Britain’s top entertainers and loved by millions across the country. He invented his own crazy lexicon including ‘Diddymen’, ‘jam butty mines’, ‘sausage knotting’, ‘tickling stick’, ‘tatty bye’ and a large number of other hilarious words and sayings which his fans will remember. 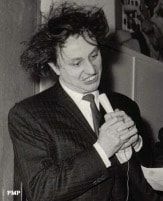 But Doddy came into his own when performing live on stage and he has spent the last 60 years touring the theatres of Britain making audiences laugh until they cried with his barrage of hilarious one liners and jokes, all of which he invented himself and his live shows are famous for continuing for several hours at a time, leaving audiences exhausted from laughing. Doddy was also a chronicler and collector of comedy history and as I know from our family visits to his home, was great company in private. Kenneth Arthur Dodd was a true pioneer and legend of comedy, loved by millions and will be sadly missed. We will miss Doddy particularly as we celebrate the life of Percy Phillips at the Beatles Convention in August and we’ll remember Ken Dodd with love as we listen to the recordings he made at Percy’s studio. 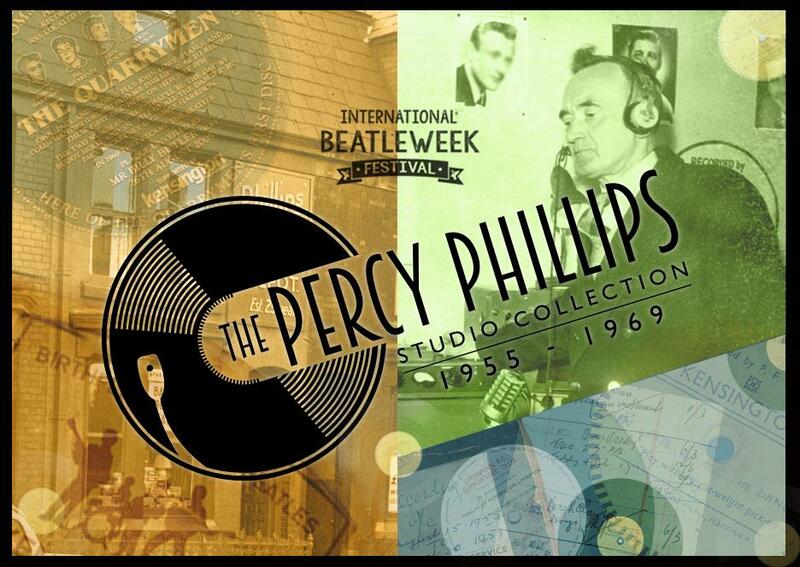 At last, we are very excited to answer that question by announcing that Speakeasy Recordings will be releasing ‘The Percy Phillips Studio Collection’ at The Beatles Convention in Liverpool in August 2018. Contracts have been signed between Peter Phillips and Pete Goodall’s Speakeasy label, following their introduction via this website in late 2016, when Liverpool student Mike Jones helped to solve the mystery of the ‘Unidentified Acetate’, which is a 7inch 45rpm disc in the Phillips Archive that turned out to be a recording made at the Studio in 1963 by Pete Goodall and his group Savva And The Democrats. There are more than 70 recordings in the archive and just how many will appear in ‘The Percy Phillips Collection’ is yet to be announced, as is the format in which they will be released and any other detailed information. But we will most certainly keep you informed of developments right here during the coming weeks and months. And we hope that you are looking forward as much as we are to hearing this unique archive of recordings made by Percy Phillips in his Studio between 1955 and 1969, especially as this year marks 60 years since the Quarrymen disc was made at the Studio. A Liverpool student has helped to solve the mystery of an unidentified acetate in the Phillips family archive. The acetate disc is an extended play 7 inch 45 rpm from 1963 on which are four classic rock 'n' roll songs, including ‘Shakin All Over’ and ‘Love Too Much’. In the course of his studies, Mike Jones contacted a number of Merseyside musicians who had been on the Liverpool music scene in the 1950s, 60s and beyond. One of these musicians was guitarist and owner of Speakeasy Recordings, Pete Goodall, aka Thunderclap, who is known Worldwide for his work with Thunderclap Newman, the Troggs, Karl Douglas and many others. 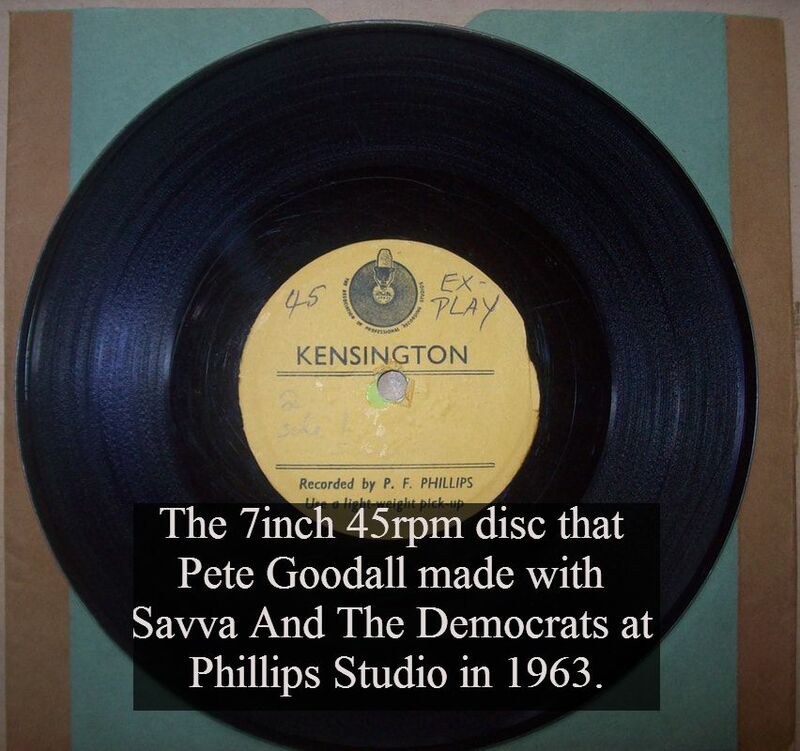 During their conversation, Pete Goodall told Mike that he had made a disc with his group Savva And The Democrats at Percy Phillips’ studio in Liverpool in 1963 and the disc had helped Pete get his first contract with Peak Promotions. Pete then visited phillipsacetates.com where he listened to the documentary, ‘The Kensington Records Story’ and was amazed to hear an excerpt from the disc that he had made at the studio fifty three years ago. Here at phillipsacetates.com we were stunned to receive a call from Pete Goodall in which he told us what he had discovered about the ‘Unidentified Acetate’. We arranged for Pete to visit our London office, where he met up with Peter Phillips, who presented him with a digital copy of the four recordings from his 1963 session with Savva And The Democrats. It was indeed an emotional moment for us all as Pete sat and listened to his first ever record for the first time in fifty years. Pete described how he had put The Democrats together in 1963 to back his friend Savva. ‘In 1963 I was just 18,’ Pete told us, ‘and having a gap year before coming down to the Smoke. I put the band together and made that disc to try and get a record contract. We came into the studio and set up just as if we were playing a live gig. And indeed we played the disc to Wally Hill at Peak Promotions and on we went from there.’ And their rocking versions of the four songs (particularly Pete’s superb electric guitar playing and Savva’s vocals) on the disc got the group their first professional contract. Peter Phillips said he was ‘gobsmacked, excited and delighted’ to discover the identity of the group on the ‘unidentified acetate’ after so many years and offered his thanks to Liverpool student Mike Jones for starting this chain of events. More news will follow on this exciting development in the coming weeks. The BBC in the UK have commissioned a series of television programmes about pop music and culture in Britain from the 1950s up to the present day. Production company 7Wonder are making the series, which will be aired on BBC Four during 2016. The first programme, presented by British cultural icon Twiggy, will be focussing on pop music and culture in the 1950s and early 60s and will be aired on BBC Four television at 9pm (UK time) on Friday 15th April 2016. The programme will feature the journey from skiffle to rock ‘n roll, including a look at Percy Phillips’ recording studio in Liverpool, in which Twiggy talks to Percy‘s grandson Peter about the recordings made at the studio, including the Quarrymen acetate. Along with the television programmes, the BBC are running an online project, in which they are asking people who have memories and souvenirs of their own personal pop history, to contribute by sending images of things that they have collected, such as tickets to concerts; photos; autographs; t-shirts; record sleeves and other memorabilia saved from the past few decades. bbc.co.uk/peoplespop where you can upload any images you want to share and memories you might have of your own ’pop history’ and browse images and memories that others have already uploaded to the site. The BBC will be featuring some of these contributions in future programmes in the PHOP TV series throughout 2016. 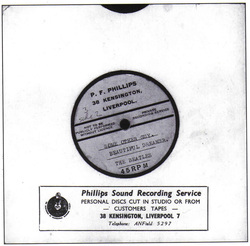 Phillips Sound Recording Services is a truly unique part of Liverpool’s music history. In this small terraced house in Kensington an amazing number of remarkable events took place, which at the time did not seem unusual to Percy Phillips. Indeed, they seemed mundane and all in a day’s work. But today it is clear to see how Percy’s work was pioneering in the 1950s and 60s. Percy grew up during a time of enormous technological change. When he was born, in 1896, there were many pioneers at work in the World. Inventions such as photography (1826); the telephone (1876); the automobile (1885) and wax disc recording (1877) were changing the planet. Sustained powered flight; a national grid of electricity; radio and television were yet to come. During the early part of the 20th Century, all across Europe and America, a technological revolution was taking place and Percy Phillips was a part of it. Like millions of others, Percy fought in the 1st World War. He was seriously injured in a gas attack in France. During the 2nd World War his battery business helped people in Liverpool get through the devastating destruction of the bombing which reduced parts of Liverpool, including Kensington, to rubble. After selling bicycles and motorbikes at the start of his career, then batteries and early electrical appliances, Percy's recording and disc cutting service was the first in Liverpool when it opened in 1955. He demonstrated the earliest example of ‘Musique Concrete’ to be heard in Liverpool on the 28th September 1956 at the Liverpool Philharmonic Hall. He cut the first Rock ‘n’ Roll record in Liverpool (Johnny Guitar and Paul Murphy’s cover of the Little Richard song, ‘She’s Got It’) on the 14th June 1957. He cut the first disc for Liverpool’s first true Rock ’n’ Roll star, Ron Wycherly aka Billy Fury in April 1958. He cut the first disc for Liverpool’s (and indeed Britain’s) biggest ever music act, The Beatles, known as The Quarrymen at the time, in July 1958. And Percy cut the first ever football pop song in Britain, for Everton Football Club, in 1963. He also gave the first public demonstration of ‘stereo’ in Liverpool, when he put a pair of speakers outside the front of the house and gave the neighbours a surprise by playing a disc specially made by EMI which was a recording of a steam train passing at high speed. 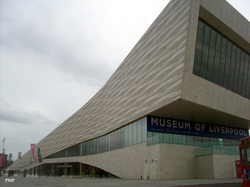 ​Liverpool has certainly produced its share of pioneers. 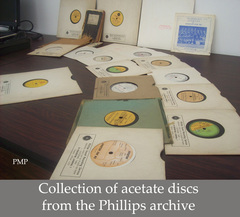 You can hear clips of the recordings made by Ken Dodd; Johnny Guitar; Billy Fury; The Quarrymen and Everton FC, and some interesting interviews, by going to the AUDIO page (or clicking here) and listening to the phillipsacetates.com documentary, 'The Kensington Records Story'. To mark thirty years since the passing of Percy Phillips in 1984, phillipsacetates.com have produced a short documentary charting the story of Percy’s Liverpool recording and disc cutting studio, focussing on the music and memories of some of the people who visited the studio between 1955 and 1969. In the programme, 'The Kensington Records Story', you can hear previously unreleased material, including Percy Phillips himself, singing a duet with Betty Roy, along with many other rare recordings from the Phillips family archive that have not previously been available. You can also hear from some of the musicians who made recordings at the studio over the years, including John Lennon; Paul McCartney; John Lowe; Colin Hanton and Mike Byrne, about their memories of cutting an acetate disc at Liverpool‘s first recording studio. Along with rare recordings and interviews the documentary includes what is undoubtedly the first ever football pop song, made by Percy and one of Liverpool’s famous football teams in 1964. And there is a mystery to be solved as you listen to an acetate from 1963 which is a popular song of the day performed by an as yet unidentified group of musicians. (Identified in 2016 as Savva And The Democrats). The progress of recording technology is explored too, as Phillips Sound Recording Services introduced more modern equipment over the years to create the studio’s own unique sound. page or by clicking here. Here at phillipsacetates.com we hope you enjoy the documentary and feel free to contact the site with any comments or memories you might have. Acetate One side two. UNCHAINED MELODY Betty Roy and Percy Phillips. 1955. OKI FROM MUSKOGEE Steve Stuart 1969. SHAKIN’ ALL OVER. Unidentified acetate c1963. (Identified in 2016 as Savva And The Democrats). Phillips Sound Recording Services was a busy little studio in Liverpool where local people would go to make recordings of themselves either talking, singing or playing a musical instrument. Percy Phillips’ wife Hilda would reminisce in her later years about parents who would bring their children and record them singing and laughing; a man who came into the studio to make a recorded apology to his wife after an argument or a seaman off on a long voyage recording a message for his family. Hilda remembered how some people would even bring their pets into the studio to record the dog barking, cat purring or bird singing or a whole family who would come to make a recording saying farewell to a family member who was off to live abroad. Percy Phillips would also take his portable tape machine to various places across the City to make location recordings of weddings, christenings or concerts for customers, which he would later transfer to discs back in the studio. All these recordings had one thing in common, they were made for a limited audience of either the person themselves or their family and friends. But from the beginning, Percy’s studio was also used by people with a different intent. Local young musicians, who wanted fame and fortune and came to Percy’s studio from all over Liverpool to make demonstration discs. From 1956, the Studio Log book shows day after day, month after month, year after year, increasing numbers of young men making demo discs to take or send to clubs, managers, record companies and radio stations in the hope of being ’discovered’. In 1958, Ron Wycherly was one of the many young men who made their first demo disc at Phillips Sound Recording Services. It was this ten inch 78 rpm acetate disc of Ron (who became Billy Fury) singing and playing five songs on his acoustic guitar, that launched his career, after it was played to impresario and concert promoter Larry Parnes by Billy's mother Jean. You can learn more about Billy Fury and his amazing life by clicking here. Billy Fury was the biggest solo star to emerge from Liverpool during the 1950s and 60s. Born in Liverpool in April 1940, Billy became one of Britain’s best- known and most charismatic rock ’n’ roll icons, with numerous pop hits and a promising film career, until his premature death in January 1983, due to an illness which had plagued him since childhood. Most biographies say that Billy Fury’s recording session with Percy Phillips was during May 1958 but there are no matching entries in the Studio Log book during the whole of May. The Phillips Studio Log book suggests the recording actually took place on the 18th April 1958 when Percy has written, ‘Youth with Guitar. One ten inch double sided disc’. A rare photo of the acetate Percy Phillips cut for Billy Fury in April 1958. 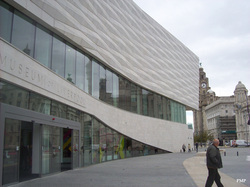 Albie Wycherley lent the disc to Liverpool Museum for their 'Beat Goes On' Exhibition in 2009. 18th April 1958. 'Youth with guitar. One ten inch double-sided.' Billy Fury? Sometimes it’s possible to say the exact date of a specific recording because Percy has written the name of the performer with the date in the Studio Log book. This was true for many sessions including the ‘Black Diamonds Skiffle’ or ‘The Swinging Blue Jeans’ for instance. In the Studio Log book on the 30th March 1957, Percy has written ‘Ken Dodd’ and an acetate in the Phillips Archive matches that date exactly, a ten inch 78rpm recording by Ken Dodd of ‘It Is No Secret’. On the label Percy has written, ‘March 30/57. Ken Dodd demo disc.‘ But often Percy would just write, ’Youth with Guitar’; 'Skiffle' or ‘Singer and piano‘, so the exact date of a recording is open for debate, as is the case with John Lennon's Quarrymen recording, made just a few weeks after the Billy Fury disc. 30th March 1957. One of Ken Dodd's many visits to the studio. Ken Dodd demo disc, 30th March 1957, corresponding to the Studio Log book entry opposite. It was sad indeed to hear of the death on the 5th September 2011 of Albie Wycherley, also known as Jason Eddie, who was the brother of Ron Wycherley, also known as Billy Fury. Albie, who was a great entertainer and singer, has been a friend to phillipsacetates.com by chatting to us about his and his brother's careers and telling us many interesting tales about Liverpool and its music and musicians. Our condolences to Albie and Ron's Mum Jean. Phillipsacetates.com attended an exciting event at Liverpool Institute Of Performing Arts (LIPA) on Saturday the 27th August during this year's Beatle Week in Liverpool. An auction took place in the Paul McCartney Auditorium, organised by Stephen Bailey of the Liverpool Beatles Shop in Mathew Street, in which many Beatles related items were sold. Amongst the many signed books, records and other valuable memorabilia that went under the hammer was the original front door of number 38 Kensington, which was of course the site of Phillips Sound Recording Services and Record Shop between 1955 and 1974 as well as being the home of Percy Phillips and his family from 1925 until Percy's death in 1984. The front door was purchased by the new Museum of Liverpool for a price of £2300 and will go on display there after being catalogued and conserved by experts at the Museum, a process which will include returning the door to its original burnt orange colour. Stephen at the Beatles Shop told us that the owners of number 38, who bought the property from the Phillips family in the mid 1980s, decided to replace the front door during renovation work on the house and realised it might be worth something to Beatles enthusiasts. Stephen then arranged for the door to be included in the annual LIPA auction and after some exciting bidding, the Museum Of Liverpool managed to buy the door, through which many of Liverpool's most famous performers and many hundreds of music fans have passed, to add to its collection of Beatles related artefacts. Phillipsacetates.com spent an extremely enjoyable and emotionally charged evening at the John Lennon Remembered 70th birthday concert at Liverpool’s Echo Arena recently, where the audience were treated to some unique performances, the highlight of which was a rocking set from John‘s original group, the Quarrymen. Cynthia and Julian Lennon; Tony Sheridan; Mersey Beat editor Bill Harry; Tony Bramwell, (the Beatles’ press officer) and Pete Best were also in town that day for the unveiling of the new Lennon Peace Monument in Chavasse Park. They were all there to pay their respects to John Lennon, thirty years after his tragic and untimely death in New York. But it was also a happy celebration of John’s birthday and amongst those in attendance was Percy Phillips’ grandson Peter who we met backstage after the show and who told us an interesting tale about a newspaper article that appeared in the ‘Liverpool Echo’ in December 1977. In the article, reproduced below, Percy tells the ‘Echo’ that he recorded the Quarrymen and the Beatles several times but erased the tapes afterwards. We asked Peter to tell us about it. Hello Peter, did you enjoy this evening’s concert? Peter. Yes, The Quarrymen were brilliant tonight. They’ve got that authentic sound of skiffle and Len Garry sounds just like Elvis! And me being a drummer, seeing Alan White, who played drums on my favourite Lennon track, ‘Instant Karma’ was something special too. Tony Sheridan was amazing. What a rocker, I remember seeing him at the Liverpool Empire a few years ago with a three piece band and he’s just got this ripping guitar sound like nobody else, he was on the bill with Donovan and The Quarrymen that night, fantastic. Yes, everyone involved tonight did an amazing job. So can you tell us about the Liverpool Echo article from 1977? Peter. Well, I remember Grandpa being interviewed by the ‘Echo’ around the end of 1977. It was because that was the year of the first Beatles Convention in Liverpool, which was held at Mr Pickwick’s nightclub on the weekend of John Lennon’s birthday that year. Alan Williams and Bob Wooler had suggested to the journalist that they went up to the Phillips Studio in Kensington to talk to Percy as the Beatles had recorded there. Alan Williams the Beatles first manager, who took them to Hamburg in 1960? And Bob Wooler the Cavern club DJ? Peter. Yes, the two of them were involved in organising that first Beatles Convention. Bob Wooler especially was a frequent visitor to Grandpa’s record shop as they were both big fans of American country music. Bob used to come into the shop and leave a few issues of ‘Mersey Beat’ magazine on the counter and listen to the latest records that Grandpa had got from his contacts at Burtonwood. (The American airbase on the outskirts of Liverpool.) Bob Wooler wasn’t just the Cavern DJ, he used to MC at clubs and events all over Liverpool and Grandpa used to make compilation discs for him to play at places like the Liverpool Ice Rink when he was MCing there. And Alan Williams had known Grandpa for years and used to send musicians up to the studio to make recordings. So you were saying you remember the ‘Liverpool Echo’ coming to interview your Grandfather in 1977? Peter. Yes, a couple of days before the bloke from the ‘Echo’ came round my Dad (Percy’s eldest son Frank) and me went over to 38 Kensington to help Grandpa look through all the studio stuff. The studio had been closed for over eight years by then and all the old tapes, discs, files and equipment were gathering dust in a corner of the room. The three of us spent the day looking through it all and listening to tapes and acetates. We discovered lots of interesting recordings and the studio log books which brought lots of memories back to Grandpa, so the next day when the journalist and photographer from the ‘Echo’ came round, Grandpa was ready with his recollections. When you look at the article now, it makes very interesting reading. Especially when your Grandfather says that the Quarrymen and the Beatles visited the studio several times, starting in 1957. Peter. Well, firstly, as he says in the interview, it is true that Grandpa used to re use tape reels, as tape was quite expensive and you could use it and record over it a lot of times before it lost any quality. And most of the time, a recording would be taped then cut onto disc then the customer would take the disc and the tape would be re used. Unless the customer wanted further copies of the recording there would be no point in keeping the tape, or they could buy the tape as well if they wanted. But as for Grandpa’s memories of the Quarrymen, I’m not sure if he wasn’t thinking of some other group or groups. The Swinging Blue Jeans; The Fourmost; the Remo Four; Gerry And The Pacemakers; the Searchers; Billy J Kramer and the Dakotas; Denny Seyton and the Sabres; Mike and the Thunderbirds and many other four and five piece groups came into the studio over the nearly fifteen years that it was open, so it would be easy for Grandpa to be mistaken about a particular recording session. Because in the interview, Percy says the Quarrymen were a four piece and had skiffle instruments, like a T- chest bass and a washboard. Whereas we know that they were a five piece when they made the famous acetate in 1958, recording ’That’ll Be The Day’ and ’In Spite Of All The Danger’ and they were playing three acoustic guitars, piano and drums. Peter. That’s right, even though the Quarrymen were a skiffle group earlier on, with the instruments you mentioned, they were continually evolving in terms of personnel, instrumentation and repertoire. Nevertheless, it’s easy to understand how Grandpa could remember it wrongly, even though he knew who the boys were, especially George, who was a family friend. There’s also the issue of the price that Percy charged the Quarrymen that day. Peter. Paul McCartney, John Lowe and Colin Hanton all say they remember it costing 17/6. And in the interview with the Echo that’s what Grandpa says too. But as he also says, 17/6 was the cost of recording onto tape and then having that transferred onto disc once everyone thought the recording was ok. All the remaining Quarrymen assert that they recorded directly onto disc because they didn’t have enough money to tape first and then took the disc home with them that same day and this is backed up by the fact that, as good as they are, there are a couple of mistakes on the recordings including a dodgy ending on ‘That’ll Be The Day’ and a late entry into a verse from John on ‘In Spite Of All The Danger’. Whereas Grandpa remembers John Lennon coming back later to pay the balance and collect the record. But if they had just recorded straight onto disc then it should have cost them 11/3. And there are anomalies in the recollections about the date and the weather. Obviously it was just another day to Grandpa but to the members of the Quarrymen it was a special day indeed, to be making a record in a studio, so they even remember the weather. Mind you, they all remember it differently! John Lowe remembers it being cold and having to wear a scarf, which they used to muffle the snare drum, Paul McCartney remembers it being a Summer’s day and Colin Hanton can’t remember what the weather was like or if his drum was muffled or not. But they’re all getting on a bit now. John Lennon would have been seventy last month. Mind you, Grandpa would have been one hundred and fourteen! But I suppose we have to believe the Studio Log book, which asserts it was the 12th July 1958, which was a Saturday. But we’ll never know for sure. Mysterious indeed. How old was your Grandfather at this time, in 1977? Peter. Eighty one. It was nearly twenty years since the Quarrymen recording session. But he still had all his marbles and was still a sprightly fellow. So we’ll never know if Percy did or didn’t make recordings of the Beatles and wipe them off. Peter. He definitely made other recordings for Brian Epstein and the Beatles. One of which we found in a box that day in the studio in 1977. But he may well have made more and wiped them off too. Peter. Yes. Brian Epstein was a regular visitor to the record shop and knew Grandpa well. Brian had a record shop too of course, NEMS, in the City centre. He sold all the top tunes of the day, LPs and sheet music but he would come to Grandpa’s record shop to hear some of the one off records that Grandpa had from the States and the two of them would sit in the shop chatting and listening to R&B and country tunes. Brian would also ask Grandpa to record many of the Beatles’ early radio appearances and put them onto disc, which he did. And it was one of those that we found that day in 1977. What was on the disc? Peter. It was a 7 inch 45 rpm acetate of ‘Some Other Guy‘; ‘Beautiful Dreamer’ and ‘Keep Your Hands Off My Baby’, recorded from an appearance on BBC Saturday Club in 1963. Really? And what happened to that disc? Peter. It continued to sit in a box in the house until 1990, when we sold it at Sotheby’s in London. It was in the same sale as the rest of the Studio equipment. Why did you sell the Studio equipment? Peter. There were two reasons. Firstly, Grandma was getting on a bit by then and the money came in handy in her old age and secondly, having the equipment in such a prestigious sale raised awareness of Grandpa’s role in Beatles history. Up until that time there was no mention of Phillips Sound Recording Services in any books about the group’s beginnings and history. A Japanese collector bought the studio and took it to Tokyo in Japan. Of course, when the Beatles Anthology was released, people became even more interested in Grandpa and the studio story. Yes, after the Beatles Anthology 1 was released in 1995, with the two tracks the Quarrymen recorded in the Phillips Studio on it and a brief biography of your Grandfather in the sleeve notes, Percy Phillips’ role in the story became more generally known. Peter. That’s right. I’d met Paul McCartney backstage at Madison Square Garden in 1990 when he was touring and I was in New York meeting a collector who wanted to buy the studio equipment, prior to the Sotheby’s sale and then I bumped into him unexpectedly in 1992 when I was working at LWT television studios in London and Paul was there to do an interview about his Liverpool Oratorio, which had just been released. We ended up sitting down for ages talking about all sorts of things, including Grandpa and the studio. At the time Paul was working with Neil Aspinall, George Harrison and Ringo on the Anthology project, so he was very interested in remembering the 1958 session at Grandpa’s studio and the various other jobs Grandpa had done for Brian Epstein. And of course he’s got the Quarrymen acetate in his collection. Very interesting. The Beatles Conventions have now being going on in Liverpool since 1977. Have you attended any? Peter. I’ve been to a few. Interest in Grandpa’s studio increased after the Anthology release and various media approached my Aunty Carol (Percy’s daughter) to do interviews. She did a couple on the radio but Carol is quite shy and modest and it irked her slightly that the media only wanted to talk about the Beatles, when Grandpa had made hundreds of other recordings, some for artists who became famous too, like Ken Dodd, Marty Wilde, Willy Russell and Billy Fury, so she asked me to take over. I’m a session musician for a living and love Beatles music and our family connection to it, so I was happier to talk about Grandpa and the studio history. Then in 2001, after George Harrison had died, I was at the Matthew Street Gallery in Liverpool at a special exhibition of photographs of George. It was a very sad time in Liverpool, as George was loved dearly in the City. At the exhibition I got chatting to a guy called Dave Ravenscroft, who was working with Beatlesdays.com at that time. He’s got a wide knowledge of all things Beatles. It was Dave who invited me to the Beatles Convention in Liverpool that year and introduced me to John Lowe and Colin Hanton, which was very exciting. I went to a few Conventions and things after that and did a few interviews. The Beatles Conventions are really good. And nowadays there‘s Liverpool Beatles Week every year. Lots of excellent bands from around the World playing the music and collectors with really interesting and rare memorabilia. A good vibe all round in fact. And what about the CD of material from the Phillips Studio. Is it likely to be released soon? Peter. Well that’s a good question. It’s taking longer than I’d hoped. There’s quite an archive of recorded material going back to the first acetate Grandpa ever cut in 1955 and I’m working with a record company to release a CD and it should be available later this year. Lots of previously unheard recordings will be on it. Well I hope you’ll let us know first. Well Peter, thanks for talking to us this evening here in Liverpool. Finally, have you seen the film ‘Nowhere Boy’, about the teenage years of John Lennon, in which there is a recreation of the Quarrymen’s visit to your Grandfather’s studio? Peter. I have seen it yes. Sam Taylor Wood (the Director) has made a beautiful, very moving and romantic film. Aaron Johnson was convincing as John Lennon and seeing all those stories we’ve heard about, such as the Woolton Church Hall Fete gig; the day when John met Paul and the portrayal of the Quarrymen recording session at Grandpa’s studio, realised on film was, I thought, superb. Yeah, it was great. Great acting; great production values; great music. And really well observed period detail, things like the sound of car tyres on cobbled streets and everybody smoking like it was good for them. Totally absorbing too, especially when you consider that other notable biopics of recent years, such as ‘Ray’, in which Jamie Foxx was Ray Charles and ‘Walk The Line’, with Joachim Phoenix playing Johnny Cash, have covered more or less the entire life and career of the subjects whereas the Lennon film focussed on just the four or five years before most people had even heard of him. I think ‘Nowhere Boy’ really stands up as a seriously good film. Peter Phillips was talking to phillipsacetates.com at the John Lennon Remembered Concert at the Liverpool Echo Arena, 9th October 2010. 1. The article from the Liverpool Echo 24th December 1977 in which Percy Phillips recalls the Quarrymen session. 2. 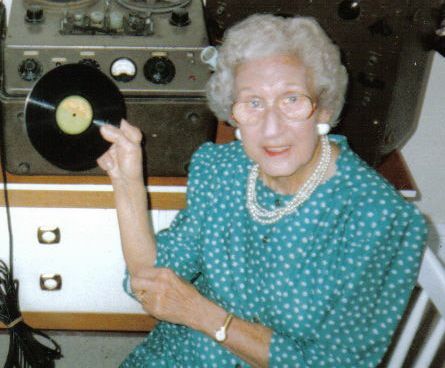 Percy Phillips' wife Hilda pictured with the Studio equipment in 1990. Rod Davies; Colin Hanton and Len Garry. 4. Acetate disc recorded by Percy Phillips in 1963 for Brian Epstein and the Beatles. 5. Percy Phillips at work in his studio in 1956.